Download ""Certification Authority" means an entity which issues Certificates and performs all of the functions associated with issuing such Certificates." 1 QUICKSSL PREMIUM(tm) SUBSCRIBER AGREEMENT Please read the following agreement carefully. By submitting an application to obtain a QuickSSL Premium(tm) Certificate and accepting and using such certificate, you indicate the acceptance of the following terms and conditions and you agree to be bound by them. This GeoTrust QuickSSL Premium(tm) Web Server Certificate Subscriber Agreement (this "Agreement") is made by and between GeoTrust Inc. ("GeoTrust") and you, a certificate applicant and governs your application for, issuance and use of a GeoTrust QuickSSL Premium Web Server Certificate. 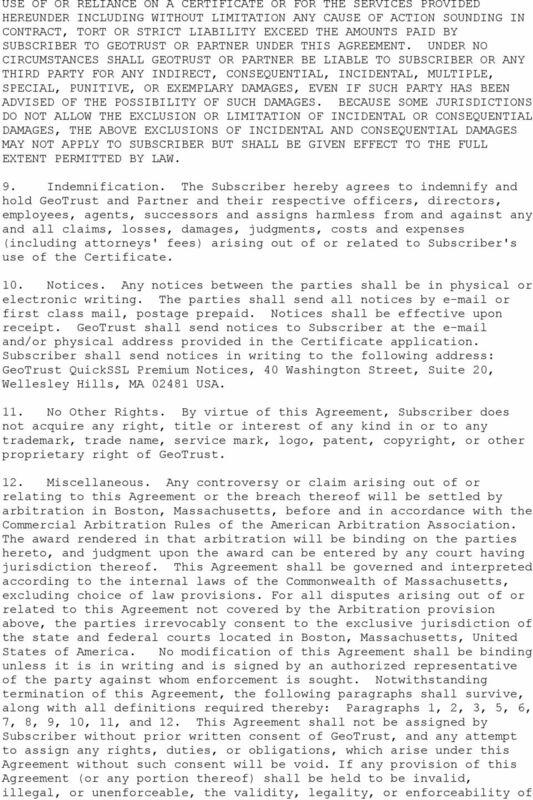 By accepting this Agreement, you represent that you have express authority to apply for and accept the Agreement on behalf of either (i) the organization named on the enrollment form ( Subscriber ), or (ii) an internet service provider, hosting company, or GeoTrust reseller ("Partner") who has express authority from the organization to apply for and accept the Agreement on such organization s behalf. To the extent that Partner performs any obligations on behalf of the organization, the term Subscriber shall also apply to Partner. Both the organization and the Partner agree to be bound by the terms of this Agreement. Subscriber hereby represents that it is fully authorized to apply for a GeoTrust QuickSSL Premium web server certificate for secure and authenticated electronic transactions. The Subscriber understands that a digital certificate serves to identify the Subscriber for the purposes of electronic commerce, and that the management of the private keys associated with such certificates is the responsibility of the Subscriber and/or its contractors. NOW, THEREFORE, in consideration of the above premises and the mutual covenants set forth herein, and for other good and valuable mutual consideration, the receipt and sufficiency of which are hereby mutually acknowledged, GeoTrust and Subscriber agree as follows: 1. Definitions. For the purposes of this Agreement, all capitalized terms used in this Agreement shall have the meaning ascribed to them in this Section 1 and elsewhere in this Agreement. 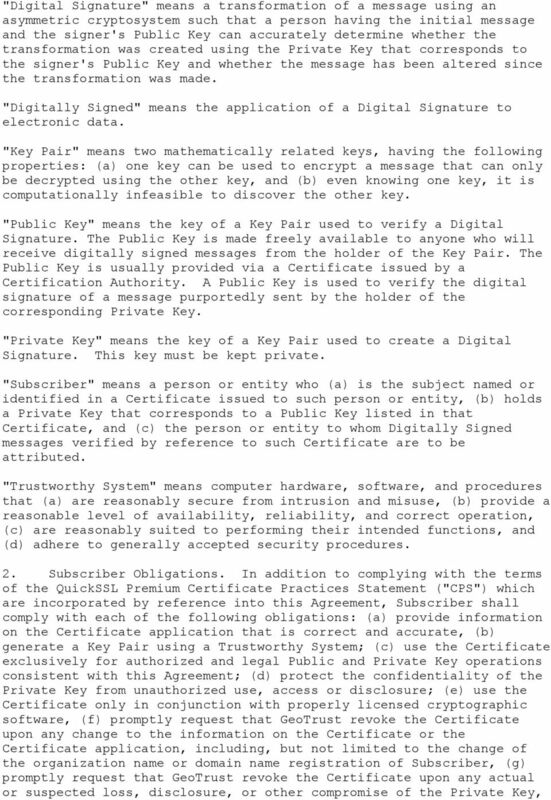 "Certificate" means a record that, at a minimum (a) identifies the Certification Authority issuing it, (b) names or otherwise identifies its Subscriber; (c) contains a Public Key that corresponds to a Private Key under the control of the Subscriber, (d) identifies its operational period, and (e) contains a Certificate serial number and is Digitally Signed by the issuing Certification Authority. "Certification Authority" means an entity which issues Certificates and performs all of the functions associated with issuing such Certificates. CSR or Certificate Signing Request means a text file submitted with your enrollment form which contains the organization name, domain name, division, country, state, city and your Public Key and is used by GeoTrust to generate your Certificate. 3 and (h) install the Certificate on no more than one server at a time. Any failure of Subscriber to comply with each of the obligations under this Section 2 shall be a material breach of the Agreement. Subscriber acknowledges the inherent possibility of the compromise of Subscriber's and/or another Subscriber's Private Key, which may or may not be detected, and the possible use of a stolen or compromised Private Key to forge Subscriber's or another Subscriber's Digital Signature. 3. GeoTrust Services. Under this Agreement, GeoTrust is a Certification Authority. GeoTrust shall only issue a Certificate upon authenticating and validating the application and enrollment information of Subscriber according to the CPS as may be amended from time to time by GeoTrust. The CPS is available for viewing at: GeoTrust, in its sole discretion, may refuse to issue a Certificate to any Subscriber. GeoTrust shall, consistent with this Agreement and CPS, and to the extent necessary or applicable, (a) receive and process the Certificate application, (b) send an acknowledgment to Subscriber of either the approval or rejection of the Certificate application, (c) if the Certificate application is approved, issue a Certificate, (d) publish the Certificate, (e) process all requests for Certificate revocation upon the receipt of an authenticated request from Subscriber, and (f) perform its other duties under the CPS. 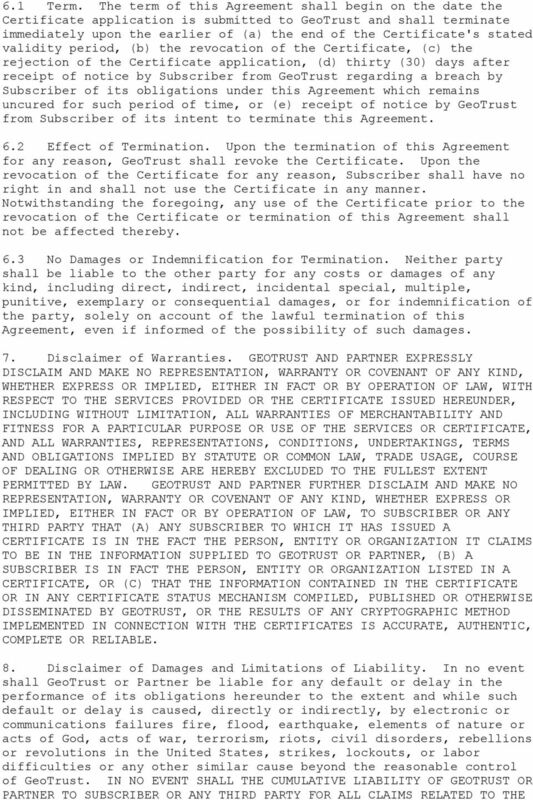 GeoTrust shall have the right to revoke a Certificate upon (a) any change to the information on the Certificate or the Certificate application, including, but not limited to the change of the organization name or domain name registration of Subscriber or (b) any actual or suspected loss, disclosure, or other compromise of Subscriber's Private Key. Upon request, GeoTrust shall use reasonable efforts to provide to all requesting parties, including entities or persons using or relying on a Certificate, information concerning the status of such Certificate. 4. Fees. Subscriber shall pay to GeoTrust or Partner (as applicable) the fees associated with the issuance of the Certificate upon the application therefor. 5. Confidentiality. GeoTrust and Subscriber agree that certain information contained in the enrollment form may be confidential and proprietary information of the disclosing party (collectively "Confidential Information") and agree to use such Confidential Information only in connection with its obligations hereunder or as permitted in the CPS. These obligations shall continue indefinitely for so long as the Confidential Information is a trade secret under applicable law and shall continue for two (2) years following termination of this Agreement with respect to Confidential Information that does not rise to the level of a trade secret. Notwithstanding the above, Subscriber hereby acknowledges and agrees that GeoTrust (a) may publish certain information provided by Subscriber in the CSR in order to establish or update a unique business identification number profile; (b) may publish or otherwise disclose the serial number and other information contained on the Certificate in connection with GeoTrust's dissemination of Certificate status information; and (c) may collect information regarding the use of Certificates and disclose such information in its aggregated form. 6. Term and Termination. The name of the Contract Signer (as hereinafter defined) duly authorized by the Applicant to bind the Applicant to this Agreement is. The Contract Signer (as hereinafter defined) is duly authorized by the Applicant to bind the Applicant to this Agreement is (as stated above).